A shrine has been created at the gates to the site of a post-medieval burial ground in Redcross Way, Southwark. This outcasts’ graveyard was already regarded as ‘ancient’ in the 16th century, when it was known as ‘the Single Woman’s churchyard’ – a reference to the ‘Winchester Geese’, prostitutes licensed by the Bishop of Winchester to work in south London’s Liberty of the Clink. By Victorian times it had become known as ‘Cross Bones’, the pauper’s burial ground. It was closed in 1853, described as being ‘completely overcharged with dead’. In the early 1990s it was partly dug up during work on the Jubilee Line Extension. Museum of London archaeologists removed 148 skeletons, an estimated 1% of 15,000 burials. The site has inspired many literary works, including 'The Southwark Mysteries', and festivals, including the annual 'Halloween of Cross Bones'. A vigil is held at the Memorial Gates on the 23rd of each month, where local people have created a shrine to honour 'the outcast dead'. Friends of Cross Bones are also campaigning for the establishment of a Memorial Garden and public park in the southernmost part of the site. Cross Bones has enormous potential as a heritage site, the living embodiment of the extraordinary social history which attracts so many visitors to the area. The creation of a Memorial Garden would establish a pocket-park in an area in need of more green spaces. It would also be a shining beacon of social inclusion in an area which is currently undergoing massive changes and disruptions to the lives of some of its oldest inhabitants. We, the undersigned, call on Transport For London and all other interested parties to support the protection and conservation of the Cross Bones Memorial Gates and to work towards the creation of a Memorial Garden and public park on the historically sensitive site of the Cross Bones Graveyard adjoining Redcross Way and Union Street. 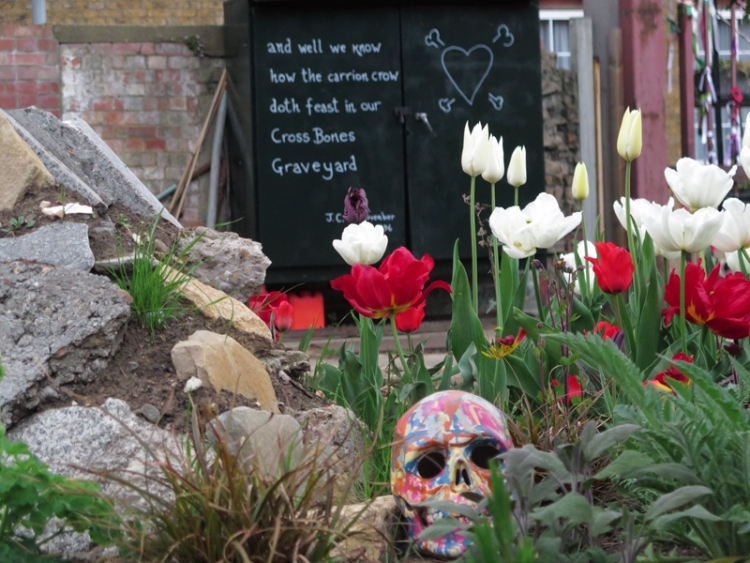 The Cross Bones Graveyard heritage site petition to TFL (Transport For London) was written by John Constable and is in the category Environment at GoPetition.